First off, I've been peeing like a race horse for days. I don't write this to be crass, but because I learned last night that there's a reason for the expression related to my treatment. Race horses are often given "lasix" to make them pee, so they will have empty bladders and therefore run faster. My nurse Tony told me this during a discussion over my "hat" and the number of times its been emptied, and the lasix in my drip. More on this later if you are interested. In the hospital hats are not for heads. 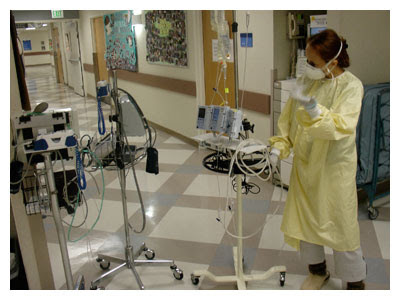 Anyway, like a racehorse I'm out of the gate, going on a stroll around the ward. (In Utah its Waard, not Ward). These strolls are really important, and I'll need lots of encouragement to take them, pukey or no. I get to get all dressed up with almost nowhere to go. 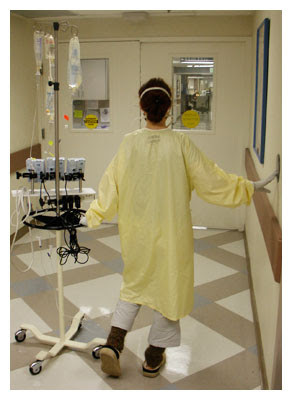 Hey Marlene, check out the legwarmers, they are they height of style with my yellow robe, hazmat mask, and rubber gloves—LDS Hospital winter collection 2008. I never travel alone. I always have my buddy the drip nearby. I'm looking for a good name for it, since no one likes to be called a "drip" even if it is what you do for a living. If you have an idea for a name, post it on the facebook group. If I choose your name, well, I'll use it. Maybe I'll have a prize for the winner. On the subject of silly walks, we'll take video of my Silly Walk in development if you want to see it!! With government backing I'm sure I could make it very silly. After my silly walk practice, I like to stop for my drip to catch up with his/her peers round the water cooler before returning to my room. Rainbows abound in E847. Keep them coming if you have them. Flatter things work best. A much more intense lymphoblasting chemo begins tomorrow morning at 6:00 AM. The horse is out of the gate. Would love to hear any suggestions concerning philosophical approaches to nausea. When its spinning, do I spin with it, or against it? Kiran, you probably know best what with the Tibetan 5 Rights! Hey Arnhem Kula, spin a few for me! Oh Ms. Brandi! You make me laugh. As for a proper name for Drip, Ruth means "friend or companion", or Ansel means "follower of a noble(wo)man".